Click the "Download" button below and download "RecoverMyPhotos-Setup.exe" to your computer. Run "RecoverMyPhotos-Setup.exe" and follow the on screen installation instructions. 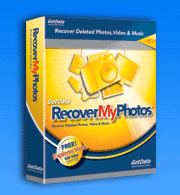 Digital picture recovery is easy with 'Recover My Photos'. Download and install 'Recover My Photos' on your PC. What you see is what you get! Any pictures that you see in the free trial version can be safely recovered once you have purchased and registered the program. A software registration key is provided on-line at the end of the purchase process and is also sent to you by email for fast recovery. Recovered photos need to be saved to separate drive (e.g. 'D:/') from the one on which they were recovered. Registration of Recover My Photos includes free updates and support for the current major version. We are the experts in digital camera photo recovery. If you would like a feature added into Recover My Photos please do not hesitate to contact us.